What Are Single Walled Carbon Nanotubes? Single Walled Carbon Nanotubes are defined as a one dimensional, cylindrically shaped allotropes of carbon that have a high surface area and aspect ratio (length to diameter ratio). Because of their small diameter and large aspect ratio, SWNTs are considered a one dimensional (1D) material. SWNTs are so named because of their hollow structure and number of walls. They’re made of one-atom-thick nano carbon sheets that forms a tube shape during CVD synthesis and are members of the fullerene family. We provide SWNTs in aqueous, solvent, & polymer dispersions and emulsions with traditional surfactants and our patented Flexiphene products. Please Note- SWNTs can’t be produced homogeneously by CCVD, they always contain significant DWNTs content. For this reason we call all of our former SWNT products a SW-DWNT mix. We can supply Hipco which are true single walls upon request. The Single Walled Carbon Nanotubes properties that have attracted so much interest in recent years are their unique physical properties and structures, electronic, optical, thermal, and mechanical properties. The single layer of carbon atoms is held together in the tube structure by hybridized sp2 chemical bonds. Depending on the chiral angle of how the tube is formed, they are considered semiconducting or metallic in nature. SWCNTs are inert and can be used to increase mechanical and conductive properties in other materials. Single walled carbon nanotube dispersion is typically done with an ultrasonic probe at a low amplitude and may require the use of surfactants or highly functionalized SWNTs to stabilize the dispersions. We use a 750 watt probe style sonicator, pulse it on/off every 30 seconds to prevent damage to the SWCNTs, and adjust the amplitude of the sonic wave to about 27%. The unique physical properties of single walled carbon nanotubes come from their 1D size, shape, their high aspect ratio, and the sp2 hybridized carbon atoms arranged in a hollow tube like structure. They consist of a single tube of carbon atoms arranged in a hexagonal pattern having 5 and 6 member rings. There are different types of SWNTs because the graphitic sheets can be grown with different chiral angles during synthesis. True SWCNTs are 0.7-1.2nm outer diameter and can be anywhere from 0.5-30um long. Longer ones are available in array form, up to 500um. 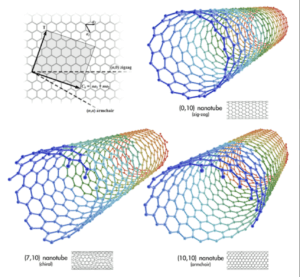 Single walled carbon nanotubes have three types of structures, Zigzag, Armchair, and Chiral. It’s possible to recognize zigzag, armchair, and chiral nanotubes just by following the pattern across the diameter of the tubes, and analyzing their cross-sectional structure as shown below. SWCNTs electronic properties are determined by chiral structure, diameter, and length. Having a diameter in the nanometer range gives them quantum effects. They can either be conducting or semiconducting, depending on their chirality. SWCNTs are metallic if the integers of equation (1) are: n=m (the armchair structure) and n-m=3i (where i is an integer). All other structures are semiconducting. Their geometry determines the band structures and the energy band gap. SWCNTs are an important type of carbon nanotubes because their properties change significantly with differing (n,m) values. The band gap can vary from zero to about 2 eV and their electrical conductivity can show metallic or semiconducting behavior. SWCNTs can be separated by density to allow sorting of the individual SWNTs by type. 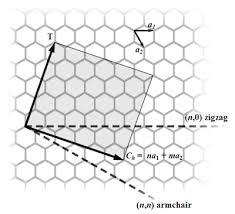 Unlike graphene, SWCNTs are either metallic or semiconducting along the tube axis. For a given (n,m) nanotube, if n = m, the nanotube is metallic; if n − m is a multiple of 3 and n ≠ m and nm ≠ 0, then the nanotube is semi-metallic with a very small band gap, otherwise the nanotube is semiconducting. Thus all armchair (n = m) nanotubes are metallic, and nanotubes (6,4) or (9,1) are semiconducting. SWCNTs can be used for their light absorption, fluorescence, and transparent conductive properties. They have been known to successfully make super black (light absorbing) materials when using a CNT array (individual CNTs standing up like a forrest) because light gets trapped between the individual CNTs and can’t reflect back to the the absorbing properties and their length. They have a tunable near-infrared emission that responds to changes in the local dielectric function. SWCNTs have been used at very low loadings 0.03wt% to make transparent conductive films for displays and solar cells to replace indium tin oxide (ITO) which has limited global resources. 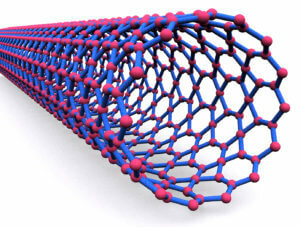 Carbon nanotubes are known to be efficient thermal conductors. They conduct heat along the tube axis exhibiting ballistic conductivity. They are considered insulators for heat moving laterally along the nanotube axis. An individual SWNT has a room-temperature thermal conductivity of about 3500 W·m−1·K−1, along its axis which is many times higher than copper 385 W·m−1·K−1. Individual SWNTs have a thermal conductivity across its axis (in the radial direction) of about 1.52 W·m−1·K−1 at room temperature. Structural defects strongly affect the SWCNT’s thermal properties. Such defects lead to phonon scattering, reducing the thermal conductivity of nanotube structures. SWNTs are one of the strongest and stiffest materials discovered. They are physically strong and mechanically flexible making them fantastic fiber additives. Their legendary strength is due to covalent sp2 bonds formed between the individual carbon atoms in their structure. The load is carried by the SWCNTs on the perimeter of each rope. Some research has shown they have an average breaking strength from 13 to 52 GPa, with an average of 30 GPa. The average Young’s modulus ranges from 320 to 1470 GPa, with an average 1002 GPa. They are very resilient. When bent, they buckle but do not break. In fact, they can easily be straightened out without any damage to their physical structure. Their theoretical Young’s modulus ranges from 1.28 – 1.8 TPa (tera pascals). A tera pascal is a pressure of about seven orders of magnitude greater than atmospheric pressure. The Young’s modulus of steel is 0.21 TPa, which is why their said to be molecularly stronger than steel at 1/6th the weight. To learn more about SWCNTs properties and applications. Please visit our CNT Properties & Applications page. What’s The Difference Between Single And Multi Walled Carbon Nanotubes? A SWCNT has just one wall. True SWCNTs are typically made by HIPCO or Arc methods. CCVD SWNTs typically have about 50% DWNTs content. For this reason we cal our CVD SWNTs a SW/DWNT mix. 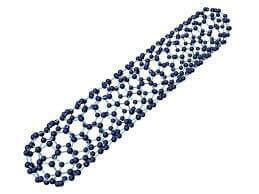 A multi walled carbon nanotubes are tubes inside of other tubes as shown in the image below. MWCNTs can have different chiral structures within the same CNT. Single walled carbon nanotubes applications include advanced electrodes, Energy storage, conductive films and coatings (including transparent conductive coatings), solar, wearable electronics, thermal interface materials, structural materials, catalyst supports, biomedical, and sensor applications. SWCNTs have been applied as the most basic building block of these systems, the electric wire. Having nanoscale diameters and an all nanocarbon structure makes them excellent conductors. Their electrical and thermal conductivity combined with their superior mechanical properties make them the ideal candidates for cutting edge advanced materials applications. Read more about SWCNTs applications here. The Van der Waals forces present make them prone to agglomeration and limits their successful use in certain applications. When working with powder form SWCNTs, it’s critically important that you achieve good dispersion, de-agglomerate, and disentangle them to the highest degree possible. While they’ll remain somewhat entangled in most cases, with proper dispersion they can be sufficiently liberated from each other to realize incredible performance unlocking their successful applications. They are typically dispersed using an ultrasonic probe at low amplitude to deliver the wave directly into the solvent containing the CNTs. High shear can also be used to disperse SWCNTs and the Silverson L5M mixers are popular. The dispersions will typically need to be stabilized unless the CNTs happen to be solvent in the solvent/matrix of choice. Many types of surfactants have been used and work with varying degrees of success. Commonly used solvents include Di water, N-Methyl-2-pyrrolidone (NMP), & Dimethylformamide (DMF). They can be dispersed in alcohols and polymers as well. 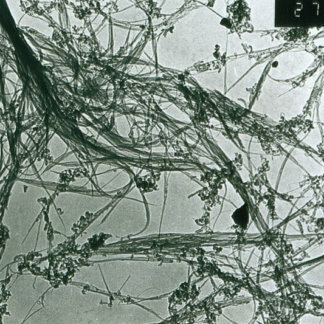 Polymer wrapping of SWCNTs is often used to promote dispersion in aqueous and other media. Some successful dispersants include oligonucleotides, chitosans, cellulose, ionic liquid cholates, lignins, peptides, and organo-sulfate surfactants. Our sister company, CTI Materials LLC, was recently awarded a patent for surfactant free nanoparticle dispersions using beneficial nanomaterials. They’ve called these products Flexiphene and they’re available on both websites. Flexiphene has been shown to make colloidal dispersions in Di Water with samples measuring -70ev by dynamic light scattering (DLS) 9 days after dispersion. Optical absorption and fluorescence spectroscopy can also provide quantitative characterization of dispersions (the amount of SWCNTs that can be suspended by a given surfactant and its ability to debundle SWCNTs) of these suspensions. Sodium deoxy cholate (SDOCO), oligonucleotides (GT)15, (GT)10, (AC)15, (AC)10, C10-30, and carboxy methylcellulose (CMC-250K) exhibited the highest quality suspensions of the various wrapping polymers studied in this work. 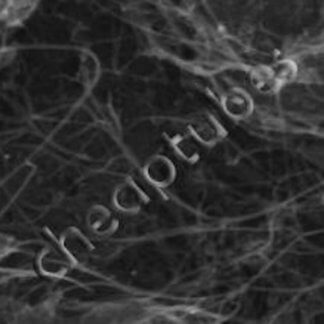 Our single walled carbon nanotubes price ranges from $75-$300/g depending on purity, length, and surface functionality. SWCNTs are grown by arc method, hipco, laser method, & chemical vapor deposition methods. Arc & laser method provide high quality and mostly single walled product mixed in with other species however they are cost prohibitive to use commercially. Chemical Vapor deposition produces very nice SWNTs, is scalable, and cost effective however there is always substantial double walled nanotube content. 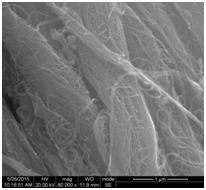 For this reason we call our CVD SWNTs a single walled-double walled carbon nanotube mix. For an in depth look at Carbon Nanotube synthesis, please see our CNT History and Production Methods page. The SWCNTs raman spectra is below, the peaks below 300 are called radial breathing mode and indicate the presence of SWNTs.